Some events have a theme and other events REALLY have a theme done right! 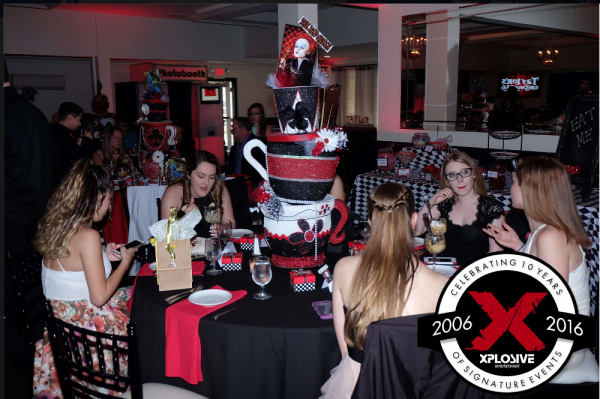 Taylor’s Sweet 16 is a prime example of taking a theme to a new heightened level. 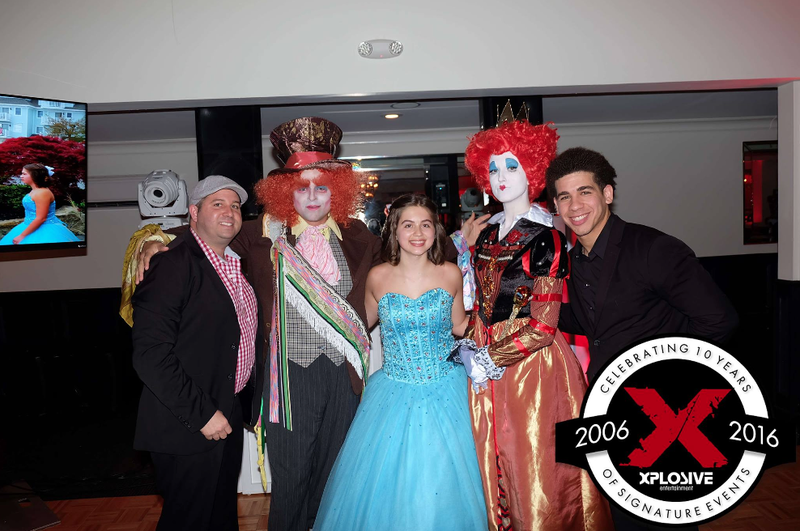 When Xplosive Entertainment was first approached by Taylor’s parents, they said the party theme would be Alice in Wonderland. 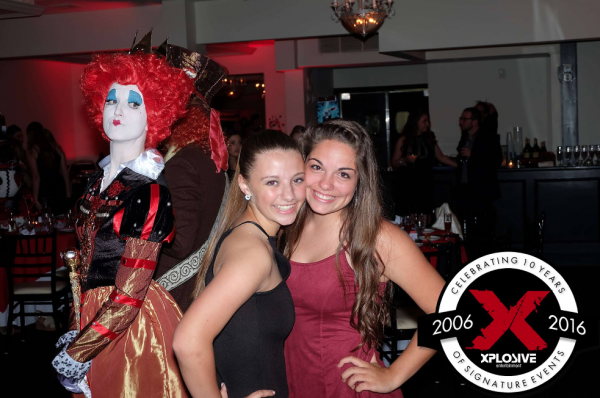 At a first face to face appointment, (which took place at the host’s selected venue, Lattitudes at Forked River, NJ) Xplosive Entertainment’s Vice President Michael Langsner showed photos from a past party with a similar theme. Then, new ideas and concepts were discussed. After several months of working together on the plan, the celebration took place and made history for Taylor on May 7th, 2016. – The Coney Island LED Photo Booth with Alice in Wonderland props that printed photos and recorded videos. were themed perfectly with each table having a unique Alice themed detail. Taylor’s grand entrance was to a song called “Welcome to Wonderland.” She entered the ballroom just moments after her guests lined the dance floor and her court first paved the path. When she came in, a cloud of low lying fog set the mood. She and her guests danced non-stop for the first 15 minutes when all of a sudden the music stopped, the lights went out and guests were asked to focus back to the doors. With another burst of fog and a bright white spot light, all of a sudden the Mad Hatter and Queen of Hearts appeared. Alice reprises #2 and #5 by Danny Elfman set the audio soundscape. Taylor knew one character would be there, but had no idea about the second which was a surprise from her parents. Moments after this reveal, we took a giant group photo and then asked guests to take their seats for dinner. 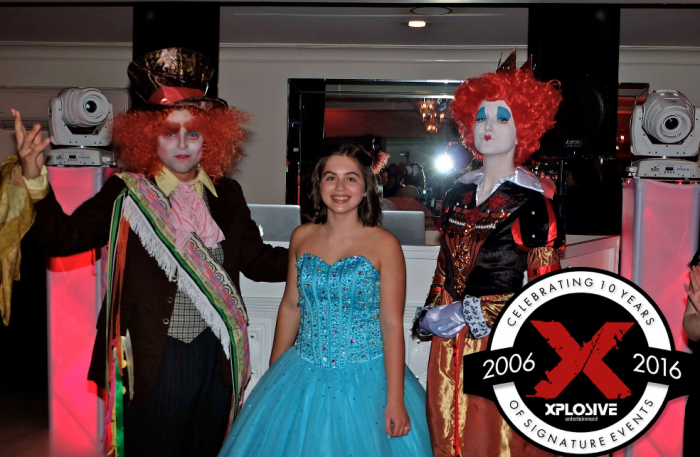 The Mad Hatter and Queen of Hearts roamed the room taking photos with guests. Later in the night, a custom made photo montage was played on the screens which was followed by the traditional father-daughter dance. Like most sweet 16’s the focus was on the dance floor. The Mad Hatter and Queen joined the guests taking selfies, dancing with glow sticks, snapping pics in the photo booth, etc. This was a magical night and we were so proud to be part of it. To provide a suggestion to anyone seeking this theme, trust your event with true professionals. 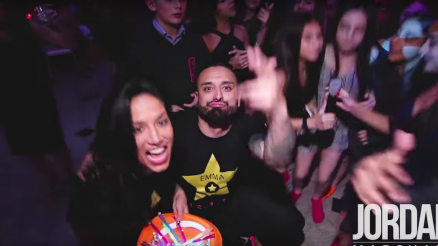 It takes a real creative mind with a slew of resources to create an event like this. 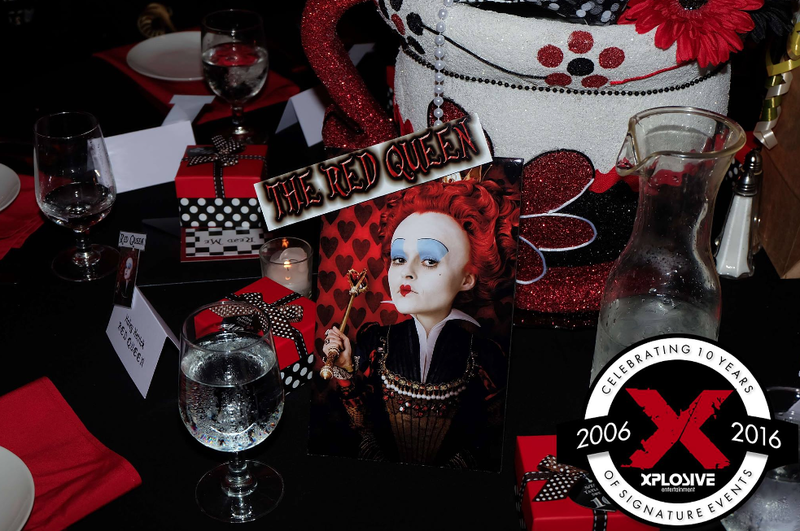 While we have participated in several other Alice themed parties, this one stands out as all the details together tied in so perfectly.